Jessica’s mother is Jennifer Lawler, a writer, and the author or coauthor of more than thirty nonfiction books and novels. She was one of my instructors in 2010 for the UCSD Extension Copyediting Certificate Program, and again my instructor in 2013 for one of her writing courses, A Non-Fiction Book Proposal. What I took away from her instructorship was invaluable information on the “how-to” of good writing. She kept me on a go-forward with fortitude writing track. Jessica is an artist, and works in fused glass. A random drawing opportunity on Jennifer’s Facebook post caught my eye. Jessica was giving away a fused glass magnet to the lucky winner. I got lucky and was picked as the random winner! All I had to do was email Jennifer, and put “I Like Your Stuff Too” in the subject line. It seemed everyone liked Jessica’s work, and Jennifer wanted some verbal recognition for her attempts at fused glass art work. 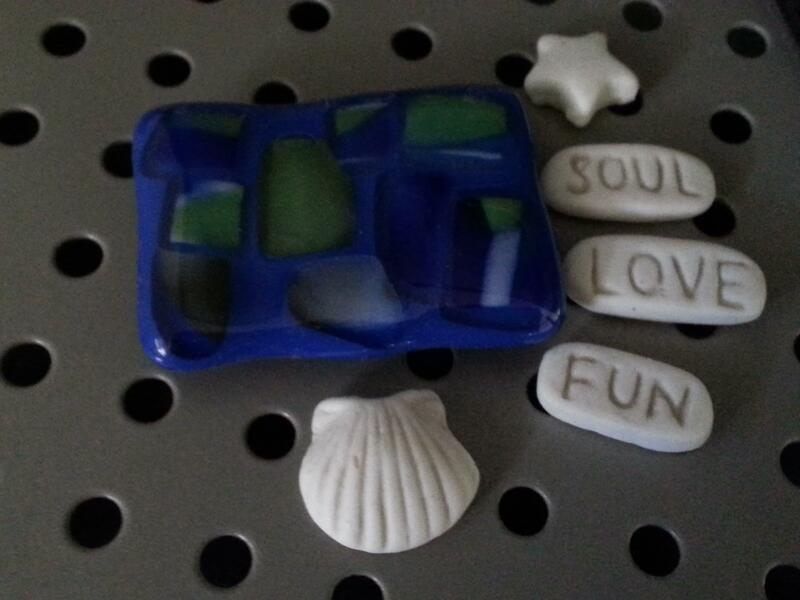 I received the fused glass magnet in the mail, and wrote a story about the “little magnet” for Jessica. As soon as I saw the brilliant blue/green Aegean Sea colors of the magnet, I knew it needed a special place in my home. So, the “little magnet” and I had a heart to heart talk about where it would be happiest. “Little magnet” brought up some things that I hadn’t thought about, and I think those things would be interesting for you to know. “Little magnet” is smart and very direct at putting me in its place. When it was placed in front of the blue/green Japanese porcelain cup on the kitchen shelf, “little magnet” was pressured to stay in perfect line with the cup. Japanese things are very picky about precise alignment. I thought the color was a perfect match, but “little magnet” really had no magnet power to stay straight. When it was placed in front of the Greek ceramic cup in my writing study, “little magnet” looked color weird. The purple in the deer design overshadowed its true blue and green sea colors. Greek things are much too bold and their intense colors really should stand alone. We both agreed not a color perfect match and no magnet power there either. I looked hard at “little magnet” in other places to find the right light for its blue & green sea colors, and the right magnet power. As you can see in the photo, we found the perfect place in my study on the metal computer stand. I wanted you to know that the special “little magnet” has a happy place in my home, with staying power right beside soul, love, fun, a star, and a sea shell. Be a happy artist Jessica. This entry was posted in My Blog, My Entries and tagged artist jessica, destruction, fused glass, Jennifer Lawler, jessica lawler, life, little magnet, neurological condition, The Little Fused Glass Magnet Story, tuberous sclerosis, UCSD Extension Copyediting. Bookmark the permalink.